Wooden name plate by R G Creations. Size of Biggest Letter: 1.75"
We are one of the leading names engaged in offering MDF Wood with Golden Letters. These are made using superior quality MDF( medium density fiberboard) and best suited to be used as nursery letters, interior signage and craft projects. MDF Wood with Golden Letters offered by us are perfect in finish and find application in households, offices & corporate houses. Durable in nature, these Wooden Name Plates are best in working and completely safe from weather. These plates are quality checked by the professionals to meet utmost satisfaction of the customers. In addition to this, these name plates are best in working and very easy to hang over the wall. Hard frame is given to these name plates. Personalize your home entrance with this nameplate crafted to create an impression. A combination of wood, and artistically deep-cut zigzag effect used with name cut in wood, suggests an artistic elegant look. 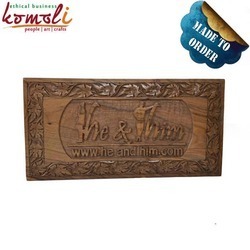 We have carved niche in the industry by supplying an unmatched range of Stylish Wooden Name Plate to the customers. The offered plates are well tested by our quality controllers to keep it perfect and skilled. Available in various sizes and designs, these products can be customized to cater the exact demands of the customers. Our company offer our clients society board & shop boards signages & designer name plate, parking signs, safety signs, street name plates, commercial signs, wooden name plate, permanent & temporary traffic signs.They have been priced at very reasonable rates in the markets & they have a very elegant.